Never Enough Nails: OPI's Blue Shatters Give New Meaning to Feeling Blue!!!! 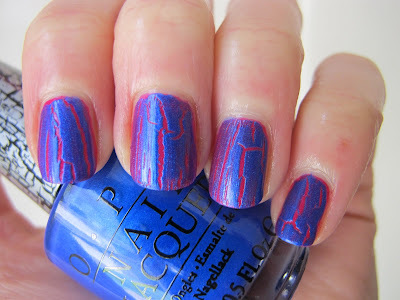 OPI's Blue Shatters Give New Meaning to Feeling Blue!!!! 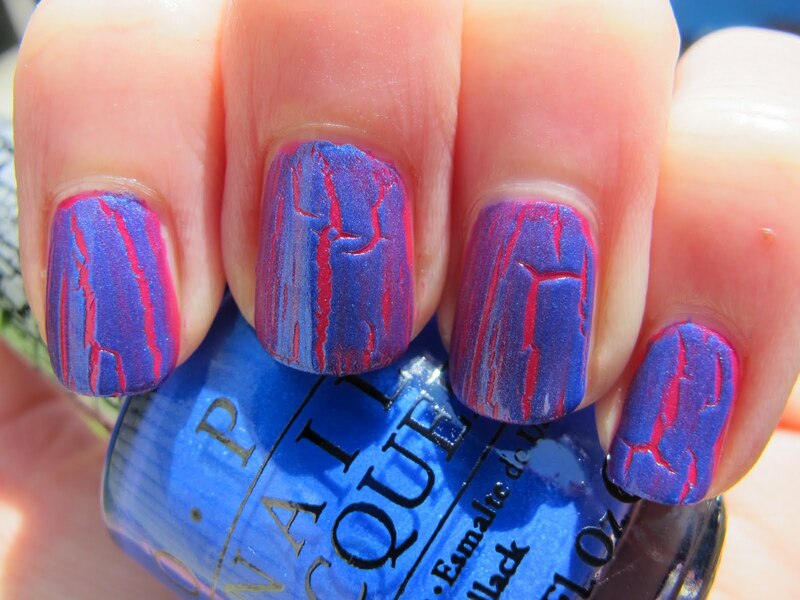 The next time you're "feeling blue", slap on one of OPI's new Blue Shatters, in Navy Shatter, Blue Shatter, or Turquoise Shatter! These three certainly cheered me right up today! I wasn't sure if three new shatters would put me on shatter/crackle overload, but the answer is most definitely NO! 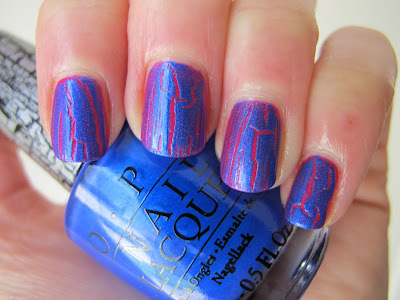 OPI keeps their shatters fresh by playing with texture and finish. 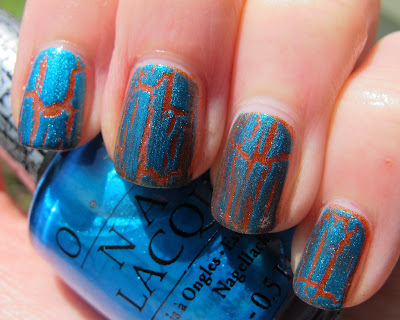 While the vast majority of other brands' shatters/crackles are creme finish, OPI has now given us a foil shatter (Silver), a jelly/creme shatter (Navy), a Satin shatter (Blue), and a shimmer shatter (Turquoise). And now for the pretty pictures!!! 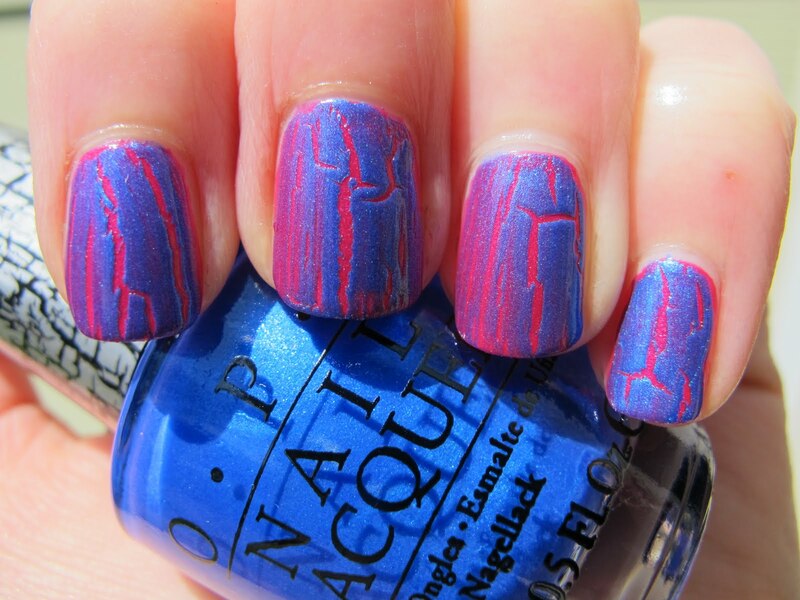 First up we have OPI Navy Shatter. 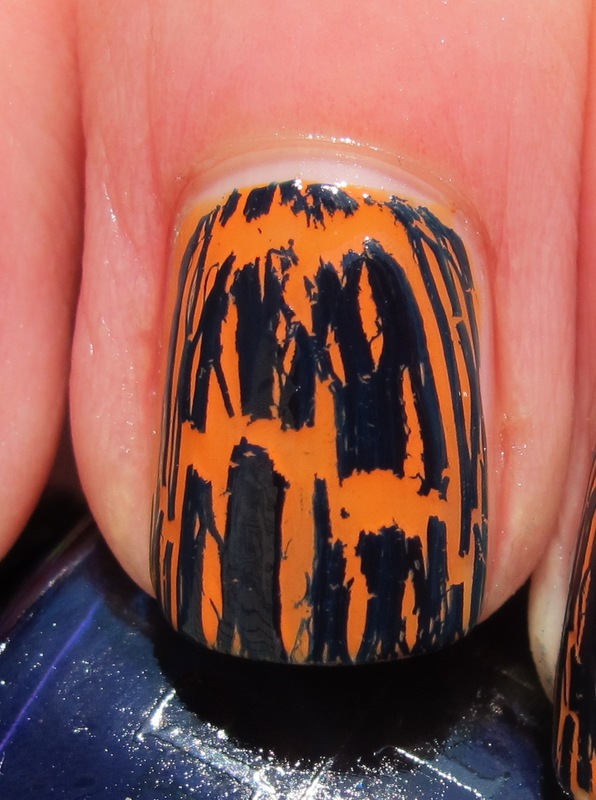 I decided to layer this over a bright, but not neon, orange, OPI Tangerine Scene (two coats). I thought these colors would really pop together, and I think I was right! I love this combination personally. I will definitely be wearing this as a full mani very soon. 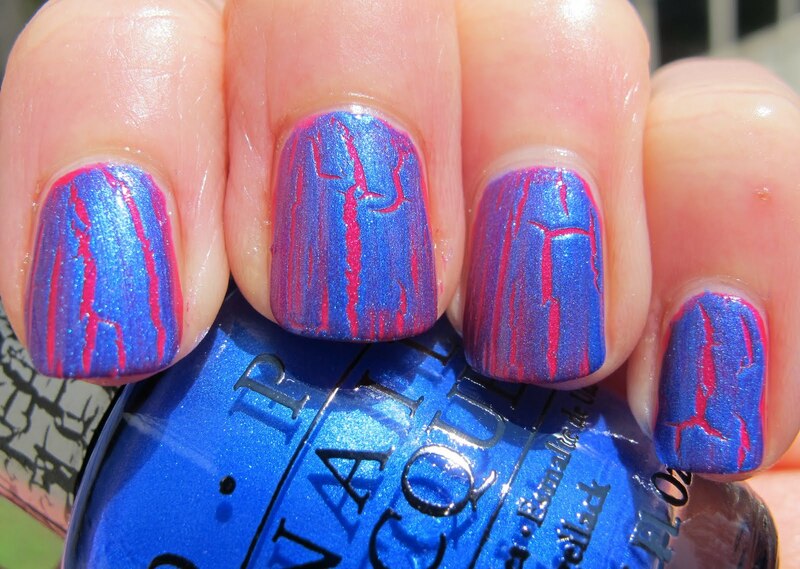 Navy Shatter is a kind of combination jelly/creme finish. It's very thin feeling, like a jelly, but dries more opaque than a jelly would. I love the texture of this, it made it very easy to apply. It felt much thinner than other crackles I have worked with. Navy Shatter shattered very nicely and I love the way it came out. These were kind of medium-thick coats, so you can see quite a bit of the base color. Again, I'm sure if you did thin coats, you would see less base color. One thing to note: see my pointer finger? I didn't really let the base color dry completely before putting on Navy Shatter (I was too excited) and when the shattering action happened, it actually pulled some of the Tangerine Scene away from that little patch there. Weird, isn't it??? I guess that's why you have to let the base color dry completely!!! Read the directions people (unlike me...)! This little patch also wasn't this obvious to my naked eye, so I went ahead and took 40 million pictures of it. DOH! 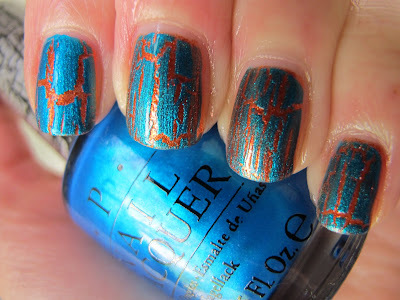 Wow... OPI Blue Shatter is so gorgeous I think it deserves a better name than just "Blue Shatter". Like, "Shatter of the Gods", perhaps? 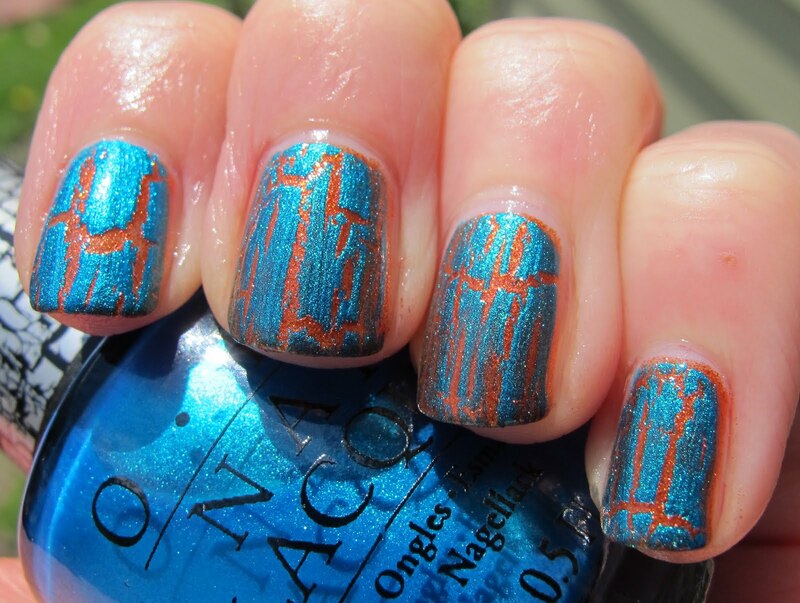 Blue Shatter is a glowing medium blue color than dries to a satin finish. It reminded me of the finish of the matte shimmer, La Paz-itively Hot matte, so I decided to pair them together. WHOA! I wish you could see this in person. It's like radioactive or something. La Paz is a hot pink with a little blue duochrome and Blue Shatter is this hot(ish) blue with a bit of pink flash in the bottle, so together they are super bright and beautiful. 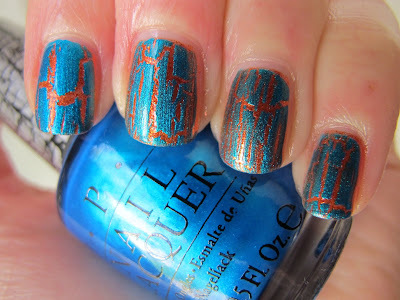 Blue Shatter was, like Navy Shatter, thinner than other crackle polishes I've used. 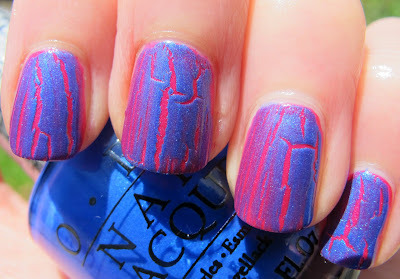 I think this lets you play around with the thin/thickness of your coats more, resulting in different cracking effects. 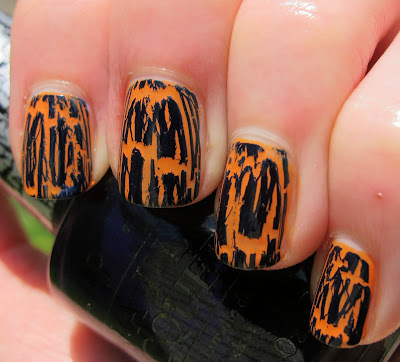 I definitely like this ability to customize your crackle. Plus, the thinness makes this easier to apply. This time, I let my base color dry all the way, and I had no troubles with the base pulling away. I can't wait to wear this in the summer! This just says "HOT" to me! Ahhhh I saved the best for last!!! 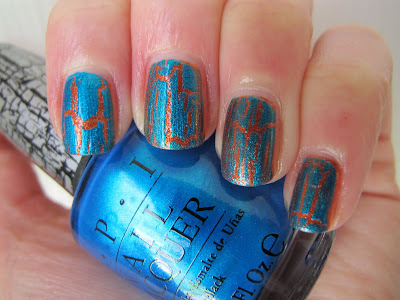 OPI Turquoise Shatter, will you marry me?? Turquoise Shatter is THE way to do shatter with shimmer. The shimmer finish is super strong and beautiful (look at those pictures of it in the sun!). This particular shade of turquoise is also amazing!! 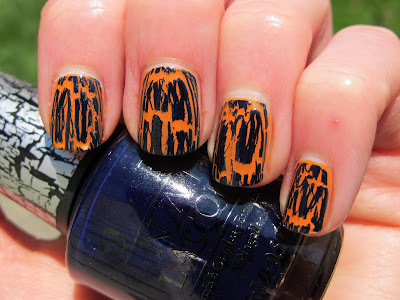 I can't think of a regular polish that is this exact color, but I would love to find one if you can think of a good match! This is the perfect mix of green and blue (not too blue, not too green) and it's so bright! You definitely need to click on these pictures and enlarge them. Do feel free to drool. 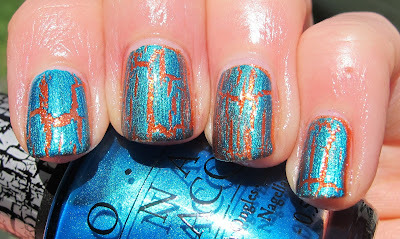 I paired Turquoise Shatter with OPI Take the Stage, a copper foil-y shimmer from the Burlesque Collection. I love the color combo, but Turquoise Shatter would also really pop over something more plain, like white, black or navy blue. It's definitely beautiful enough to be the center of attention. 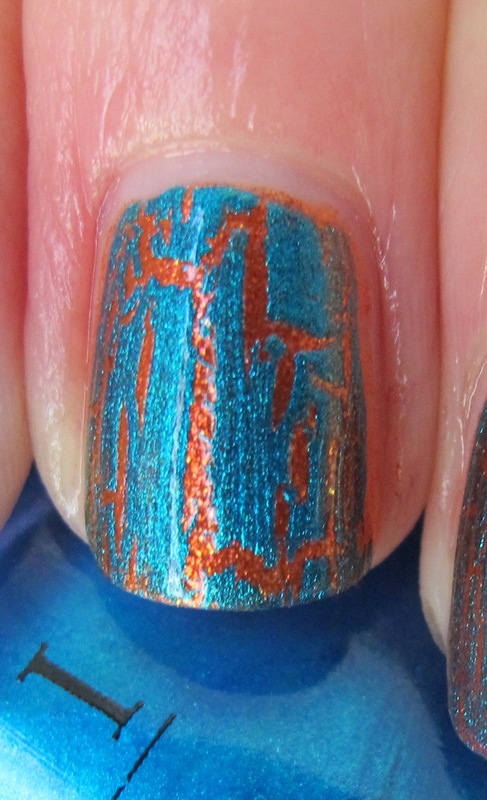 Application on this was just like the other two, very easy due to the thin nature of the polish. I did a thick coat on my pointer finger and thinner on my ring finger so you could see the difference. I prefer the thick coat myself, although this looks fabulous no matter what! Please let me know if you want to see these three Shatters over any specific colors. Leave me a note in the comments, or shoot me an email. I'd be happy to oblige! As far as I know, these three polishes will be released later in May, but I'm trying to pin that release date down a bit better for you. These will be available at the usual places, Ulta, Trade Secret, etc. 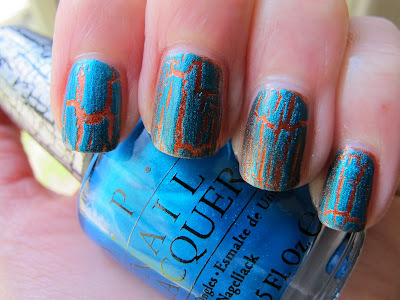 Your swatches certainly aren't helping to quiet my huge lemming for turquoise shatter! It's such a stunner! It is definitely amazing Abby!! I feel like that and Blue Shatter are the first shatter/crackle polishes that would actually be gorgeous, unique regular polish shades! Give in to the lemming for this one, you won't regret it! Love all the mani's you did! 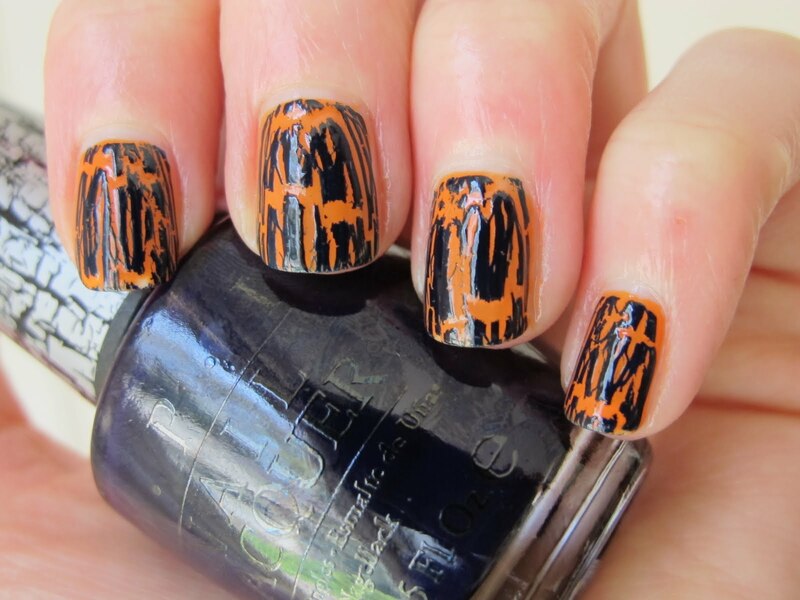 The first one would be perfect for Halloween too! Thanks TheNailAddict! It does look kind of Halloween-y! What an outstanding job! I wow'ed louder with each one. 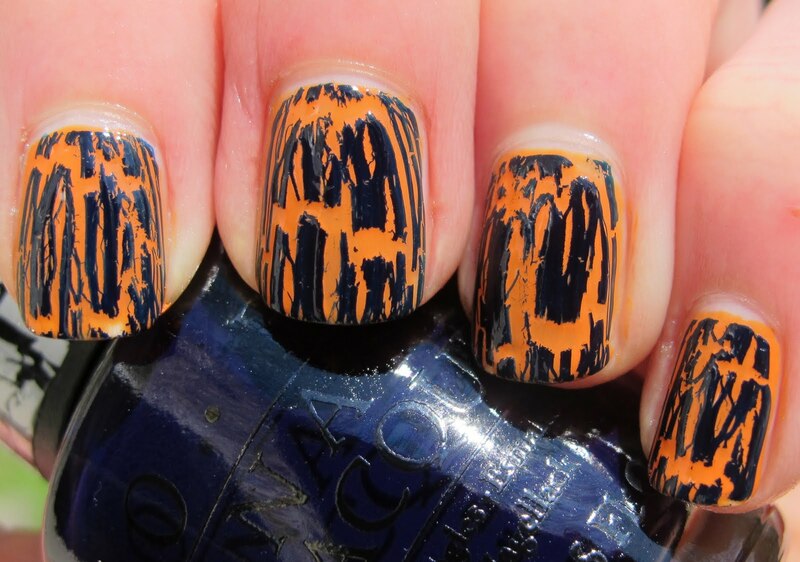 Seriously, Shatter is doing a better job than Crackle. Natalie- they apply great and shatter quickly too! 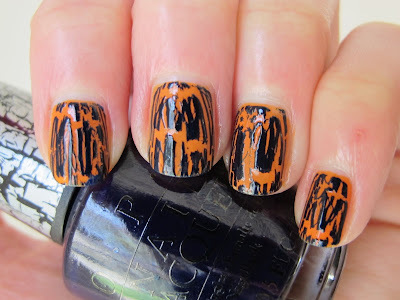 tangerine scene is a favorite orange of mine! Bright, but not neon! Kimberly- Thanks! I seriously love Shatter! After I tried the crackles, I didn't think I wanted any more crack polish, but OPI can keep 'em coming! Just found you blog and we love it! LOVING the OPI Shatter in Navy! We have not seen that yet...VA is behind! We are now following you and would love for you to check out our blog and follow back if you like. Thanks! Any info on a release date? 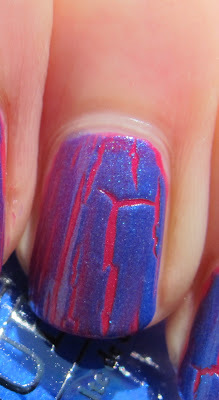 Btw are there any other shatter colors out now-other than black? Thanks! Hi Jayme and Mendi- I'll definitely check out your blog, thanks for reading! Kat- these should be coming out right now, the release was sometime in May, so keep your eyes open. Silver shatter is currently out with the Pirates of the Caribbean collection and there are Red and White shatters with the new Serena Williams duos, out now.